It rains a lot in British Columbia. Here is where the Pacific Ocean dumps its excess moisture. The mountains are covered with trees; the lichen-covered branches drip in the seemingly perpetual rain or drizzle. The summers are mild and dry but don’t last long enough. The everlasting days soon end, and the autumn rains and winter snows take over. 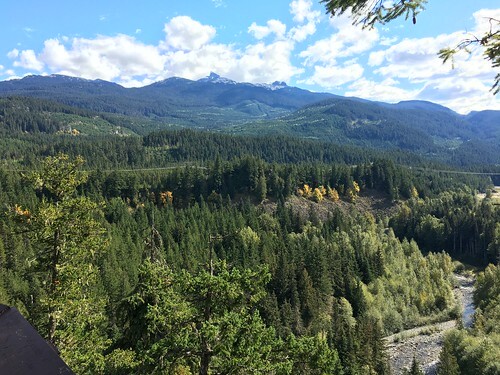 But always sunshine makes a desert and British Columbia shows how attractive the alternative can be. A green, lush rainforest has grown up. The rain feeds the rivers, the rivers attract the fish, and the fish feed the bears and the people. The salmon runs here are famous. Fishing in this sparsely populated land requires wilderness experience. This land still belongs to the original settlers, the first people. Visitors tread carefully here: they need to respect the land, its First Nation owners, their traditions and their memories. One of the many rivers is the Nass, named the Ḵ’alii-aksim Lisims by the local Nisga’a people. One if its many minor tributaries is the Ksi Sii Aks river. Later arrivals called these the Nass and the Tseax river. Tseax is a fearful name; the memories of the events here run deep. There are many ancient sites along the Nass river, prehistoric villages with their totem poles. One of these is Gitwinksihlkw (and no, I don’t know how to pronounce that either). It was settled in the 1700’s but the site at the shore of a canyon was problematic. It was badly damaged by two major fires around 1890, and surrounding villages were destroyed by a big flood in 1917. None of the totem poles survive. The people who settled here had been in a hurry and in bad shape. They were fleeing from another disaster, which had wiped out the ancient villages upstream. But the village still exists, one of four main villages along the river in which some 2500 Nisga’a still live. They are tough survivors. Their oral traditions go back a long time. They tend not to publish these traditions. Each of the four main families keeps their own distinct memories. Those oral traditions show the reality of Canada’s volcanic dangers. Although Canada has a significant number of volcanoes, it lacks the grandeur of the volcanoes of the western US, or those of Alaska. By reputation, it forms a quiescent gap between those areas. There are some impressive looking volcanoes, such as Mount Meager, Mount Baker, and Mount Edziza. But volcanic activity is so low that one of the minor peaks, the one with possibly the most recent activity, is just called The Volcano. There have been large eruptions: Mount Meager suffered a large explosion, St-Helens size, 2350 year ago. But Canada’s volcanoes have long repose times and eruptions are therefore infrequent. Young volcanoes of Canada. From http://publications.gc.ca/collections/collection_2008/nrcan/M4-59-3-2008E.pdf. Tseax is the lowest triangle in the Stikine oval. The sparse large volcanoes are supplemented by a large number of smaller cones. These may erupt only a few times or even once, before the magma finds another outlet. They may not be as eye-catching, but Canadian cones carry the past and future of its volcanism. Canada is not as brash as its southern or western neighbour; its volcanoes mirror the nation’s diversity, and here, the little ones matter. They out-trump the big volcanoes, their noisy, seemingly dominant, but ultimately harmless neighbours. The largest numbers of volcanic cones are in the northwest of British Columbia, close to the Northwest Territories and Alaska. (British Columbia perhaps is an outdated name, but ‘Canada’s Columbia’ lacks in abbreviation: who wants to be a ‘CC’?) Here, in BC’s sparsely populated north, is the Stikine volcanic belt, oriented north-south and containing over 50 locations which have had eruptions since the ice age. The activity is different from that elsewhere in Cascadia. This is a zone where extension has taken place, and this is causing the magma melt. The magma melting is dispersed over many small areas rather than a few large magma chambers. This tends to build up small cones rather than large mountains, and thus the volcanic nature of the region may not be as obvious as it is say near Seattle. The rugged deeply forested terrain further hides the evidence. The lava is basaltic. Over time, as the plate junction between the Pacific and North American plate migrated north, extension had slowed and volcanic activity has diminished. But it has not gone away. Here, at the southern end of the Stikine belt, close to the southernmost border of Alaska, is where the Nass River flows. And this was the location of the worst volcanic disaster known to have happened in Canada, the third worst environmental event in the nation’s history. The Nisga’a still remember. One of the southern tributaries to the Nass river is the Tseax. It runs through a lake, which begins at a volcanic cone just east of the river, 300 meter wide and 100 meter high; the cone is build on an older and slightly larger cone. The lake has the suggestive name ‘Lava lake’. Indeed, 300 year ago, lava came from here. The lava flowed from the crater, which is likely to have contained its own lava lake during the eruption. It flowed into the narrow Tseax river valley: five kilometer downstream, it dammed the valley. The resulting lake is the appropriately called Lave Lake; it is still here. But the lava did not stop: it went down further, exited the tributary and flowed into the Nass valley. This is a fairly flat region, and this allowed the lava to spread out more. It fanned out and covered an area 3 kilometer wide and 10 kilometer long. The total length of the flow is 22 kilometer. It covers and area of 38 km2, and the average depth is over 10 meter. The volume is some 0.4 km2. It was a sizable eruption! The Nass River lost its bed and had to relocate 1 mile to the north. The valley was inhabited, and the local population was badly, perhaps surprisingly badly, affected by the eruption. The survivors fled and settled downstream, in Gitwinksihlkw. The Nisga’s land, centred on the Nass River. The lava bed memorial park is in green. The lava field is still there and is now a memorial monument. The Nisga’a consider it a burial site, and for good reason. The Nisga’a Memorial Lava Bed Park (which also carries several less memorable names) was established in 1992 and is the only BC provincial park jointly managed with a First Nation. It is not difficult to get to, and there is a small camp site, but be prepared to drive on unpaved roads. The lava beds contain a mixture of smooth pahoehoe and rough a’a. There are lava tubes and tree casts, the latter vertical holes where trees were burned after the lava passed. The lava has developed a coat of green moss, courtesy of the climate. 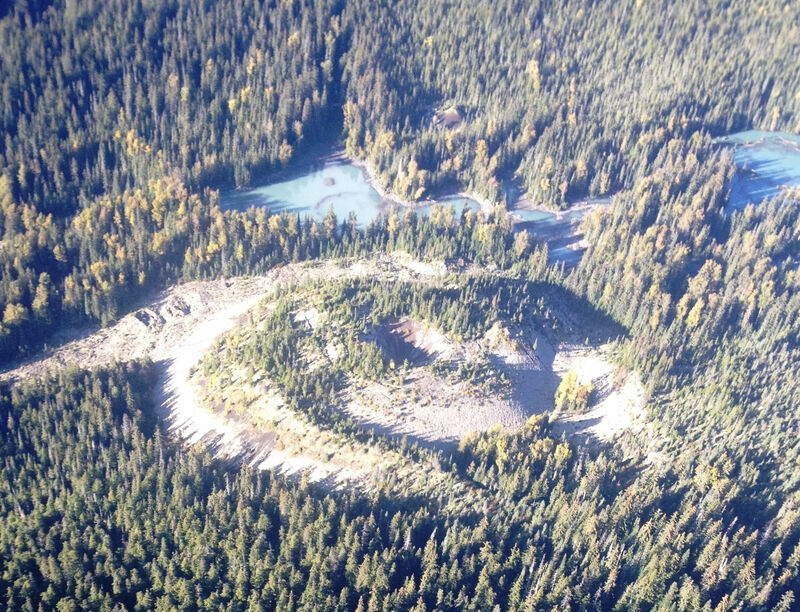 Tseax is the main and youngest cinder cone, but there are other cones in the area. This is one of the more accessible places in Canada to witness it volcanic history. First there was smoke, like that coming out of a house, a big pillar of smoke. It was as if a house was burning on the mountain top. The people saw a big fire. The fire came down the side in their direction, but not as fast as a forest fire. It moved down slowly, very slowly. It was strange and frightful. Invisible fumes pushed ahead of the advancing wall of fire. Those who smelled them were smothered, and stiffened like rock. According to the stories, about 2000 people died, and two villages were destroyed. The death toll must have amounted to a significant part of the population. Long ago, two children were playing down by the river. One child caught a salmon and slit open its back. The child stuck sticks into the salmon’s back, set them on fire, and returned the fish to the river. The children were amused to see the salmon swim erratically, smoke rising from its back. The other child caught a salmon and slit open its back, inserted a piece of shale, and put it back into the river. The salmon floated on its side, weighed down by the shale. The children laughed at the struggling fish. An elder happened upon the scene and warned the children, “Take care what you do. The salmon will curse you and the Creator will respond in kind.” The ground began to tremble and shake. Nature’s harmony had been upset. A scout was sent to investigate. From the top of Gennu’axwt, he saw smoke and flames and ran to warn the people of their fiery destiny. In panic, some villagers fled up the mountain. 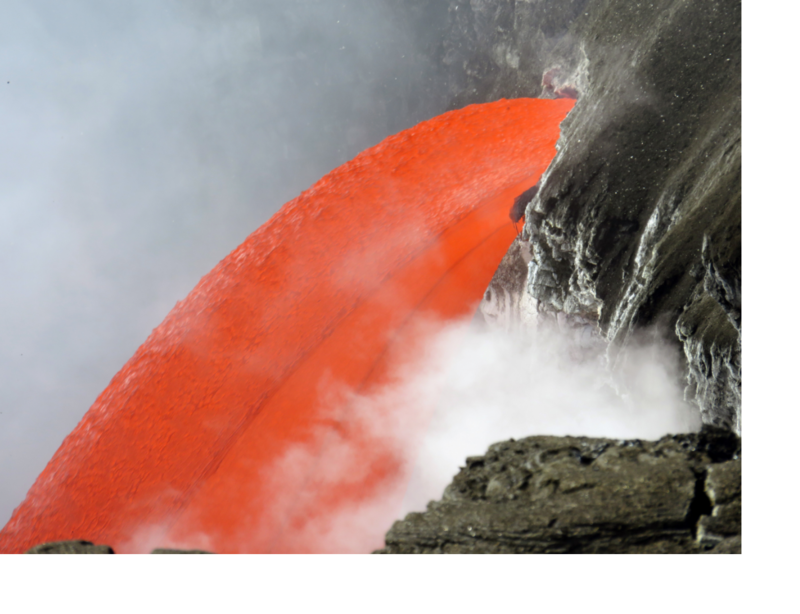 Others canoed to the far side of the river but were killed by the lava. As the people watched the lava flow over their villages, Gwaxts’agat (a powerful supernatural being) suddenly emerged to block the lava’s advance. For days, Gwaxts’agat fought back the lava by blowing on it with its great nose. Finally, the lava cooled and Gwaxts’agat retreated into the mountain where it remains to this day. Another source states that people dug pits for shelter but died from poison smoke. From the stories, it was thought that the eruption would have happened around 1770 and this is the data given in many places, such as Volcanodiscovery. A second line of evidence came from tree trunks in places where the survivors had settled. These trunks showed evidence that bark had been stripped, and this was provisionally dated to 1770. A similar date was obtained from a report by the first modern visitor here was from Peru, Juan Francisco de la Bodega y Quadran. His ship, the Sonora, arrived in Bucareli Bay in 1775. On arrival at the mouth of the Nass he wrote about his young crew They suffered somewhat from the heat, which they attributed to the great flames which issued from four or five mouths of a volcano and at nighttime lit up the whole district, rendering everything visible. This has been used to date the eruption to 1775.
the orientation of the magnetic field. The lava records this while it cools and solidifies. But the magnetic north pole moves around, and when as close to it as Canada, the angle towards magnetic north changes significantly. The angles in the lava do not agree with where the magnetic pole was around 1770. The combined evidence indicates that the Tseax eruption happened in 1668–1714, with a smaller possibility that it was a century earlier. This was published by Michael Higgins in 2009, who speculates that the eruption was caused by the megathrust earthquake of 1700, because of the oral tradition that the ground shook before the eruption. But this appears at best unproven. There is an older lava flow from this cone, for which a C-14 data of 1330+-75 is quoted. This is a so-called ‘uncorrected’ date, which does not take into account natural changes in the C-14 in the atmosphere. Correcting for this gives a ‘corrected’ date (the date for the recent eruption is a corrected date): for the older eruption, this becomes 1240+-67. The death toll is highly uncertain, based on the oral memories. But it is likely to have been high. It is not the largest environmental disaster of Canada. A hurricane at Newfoundland in 1775 killed an estimated 4000 people, and the death toll of the Cascadia megathrust earthquake in 1700 is unknown but must have been considerable. The Tseax eruption ranks third in this list. But effusive, basaltic eruptions tend to be relatively safe: the lava flows are slow and people have time to get out of the way. What made this eruption so devastating? That is not known. The narrow river valley may have channeled a mud flow. The mentioned of invisible fumes has lead to suggestions that poisonous gases were the main killer. CO2 has been suggested as the killer, and is indeed invisible, though lacks smell. But the description of stiffened bodies is suggestive of intense heat. Perhaps a pyroclastic-like flow came down the narrow river valley. Against this, there is no evidence of an explosive eruption. Perhaps the narrow Tseax valley amplified an otherwise minor event. So uncertainty rules. It would be good to resolve this issue: whatever danger is lurking in the mountains could be vastly more destructive nowadays. Canada has few volcanoes and repose times are long, so that eruptions are not considered an important hazard. The monitoring is far less extensive than it is in the US. But even if the monitoring were more comprehensive, this eruption did not come from one of the main volcanoes. This wasn’t Mount Meager. It was a small cone, and there are many of these in Canada. Hiding in the wilderness, how much do we know what they are brooding? And it seems that Tseax is a repeat offender which produced another lava flow around 1240. Neither do we know why so many people were killed. There is danger here. Canada is not known for its volcanoes. Perhaps it should be. Update: the image of the Tseax cone has been replaced after it was pointed out the original was wrong cone. This test video I made is just to show what I would like the end product of my visualisations to be. To kinda explain what is seen or what is visible, which is easier to say than to write. There is sound 😀 I’ll have to watch it again. Really nice 3D presentation. And to Albert another good article. The fire hose in Hawaii has returned on the new collapsed cliff. Fantastic article Albert – thank you once again! On another note, please might someone be able to direct me to the Tromlurit page on Veðurstofa Íslands? On my habitual link, I get the Iceland chart with measles (the stations!) as usual, but all the links are leading to page-not-found messages. I think they must have updated it. Thank you so much for that! I need my drum plots as much as my coffee! And KIS is up again! Thanks, Albert, for another excellent piece of work. That’s darn odd… Is this the first time the Montreal VAAC has had to issue an Advisory? With this article, the timing is perfect. The funny bit is that several months ago, I did a write up on fictitious Mt Gibbons in order to illustrate something to do with volcanoes. Little did I know there was,an actual Mt Gibbons. If I remember correctly, the real Mt was not even of volcanic origins. I picked the name because of a legendary guitar player. Thanks Albert for another intereting post. Interesting with the multichanneled feeder system. Obvously no pet volcanous here even when small and sleepy. No, even these cones are not pet volcanoes. In the volcano world, small can still be dangerous. What I was most concerned about is that the ‘poison gas’ was attributed to CO2, while it is likely it was something else. To me, that suggests that the hazards from sites such as Tseax are not well enough understood. What would be the options? Hydrogen sulphide, SO2, HCl? Or a ‘cocktail’ of several (and probably including CO2 as well)? Yes, I had been wondering about steam. It doesn’t quite fit the bill though. Invisible fumes which can be smelled and leave bodies stiffened. Some sulphur component? SO2 can be hot? – Leaves bodies stiffened? Rigor mortis or freezing will do that. – Deadly invisible volcanic gas? CO2. – But can be smelled? Trace of SO2 or H2S. That would be my simple reading. In high enough concentrations, CO2 apparently has an acidic smell. Think I found that on Wiki yesterday when I was Googling around. Don’t really know about the fumes but heat from a pyroclastic flow can do some damage. Would the air in front of the PCF be hot enough to cause muscular stiffening? High levels of CO2 are hugely detectable. I once put my head into a large fermentation vat and the immediate reflex threw my head back such that I fell over and my neck hurt for a week. Its very strong. So people probably don’t die peacefully, but severely gasping for breath and in intense discomfort. I didn’t know that about CO2! Can you get those kind of concentrations in the open air? A separate smelly component and killer CO2 could work. The stiffening is not rigor mortis, at least judging from the oral tradition. It was fast and so unusual that it was told about for 300 year. Pyroclastic heat (superheated steam) can do that. On the other hand, people should have time to communicate about the smell! But this is getting on very thin ice. You have to read a lot into a very brief story. If people were seen to be so affected from a distance, than the ‘smell’ would be interpretation by the witnesses, based on the reaction of the victims. Some independent evidence on the composition of the lava would be nice, especially any air inclusions (wishful thinking). The important point is that the tradition remembers the exceptional. They were familiar with forest fires, so this was very different from heat from a fire. This is getting a bit too morbid for me. I am guessing that you could get those concentrations associated with a PCF. Also Lake Nyos once emitted enough CO2 to kill thousands. Remember for aqualung diving almost all of the air (oxygen) is wasted as each exhaled breath is discharged as bubbles. Almost no oxygen has actually been used but the CO2 levels do not allow much rebreathing. Rebreathing kits that absorb the CO2 and allow the air to be reused do work but seem to carry a high risk. The reason is that CO2 levels are what initiates the taking of a breath because this is how the body discharges its CO2, and this is important to keep blood pH at safe levels. If you inhale air with significant (a few %??) CO2 you hyperventilate as your body carbonic acid levels elevate and blooh pH plummet in a vain attempt to excrete it. So its true, CO2 is ‘odourless’ at normal concentrations but its physiologically very active. This article is hopefully will open eyes to the fact that that little cone outside your window may have a not so little capability..Here in Eastern Oregon and Washington we have cinder cones and lava fields in abundance.. Most of which have potential. country of Idaho…Of course no attention was paid to family, and residence..
You know, just stories and all.. There was another M5 in the same region of western Turkey today, south of Gaillipoli, following the earlier swarm. That is now 3 M5+ in a few days. This region had a number of M7+ earthquakes but mainly a century ago. Nothing since the 1980’s, apart from one fairly big event two years in the Aegean Sea. The area can do M7.2 but hasn’t for some time. A big one would be really bad in normal circumstances, but the area has got absolutely huge amounts of snow in recent days/weeks, so a big one now would be an utter disaster. Is that tremor on the KIS station? Visible continuous signal on both highpass and lowpass drums. All three lines of the tremor plot are a bit high. Any thoughts? It seems to have settled down to normal levels now. A signal like that is usually bad weather or running water, but I don’t recall any of those showing up on the low frequency plots like this. Every time I have come across FEMAs action, they have royally mucked things up and caused any disaster to last longer than it should. Why is that? Too much red tape, ill-prepared, or too many different organisations? Or something else? Wow, Oraefajokull got a deep infusion it seems. Two outstanding things from my last half-an-hour. First, the Oraefajokull swarm. This is significant. It means this active Icelandic volcano is awakening to life and this is a deep and significant magmatic intrusion. Its eruptions can be some of the most violent in Iceland. The volcano erupts rhyolitic magma and is the tallest volcano (and one of the largest) in Iceland. And surface winds driving over it. The point is that for a switch to happen in the decade-long transition to an ice age requires systems with decade -long natural periods. The atmospher of itself is fickle, varying in typically months and only rarely for a couple of years. The astronomical variability is measured in centuries or millennia. Now its certainly possible to have a two-state system that switches rapidly between two stable states but ice-age changes are not instant switches of state, they take decades or centuries. For this to work you need a system that acts over decades to centuries and an oceanic current is a really good culprit. Iff a gulf stream that discharges into the arctic ocean generates an ice age then this will be stopped when it can no longer reach the arctic, due to lower sea levels and ice dams. At that point, though, you are still in a stable ice-age which may take a long time before it eventually is overcome which results in runaway warming until conditions are such that the gulf stream can flow into the arctic again. Quite a neat theory with some quite compelling arguments but sadly based on no modelling or evidence whatsoever! 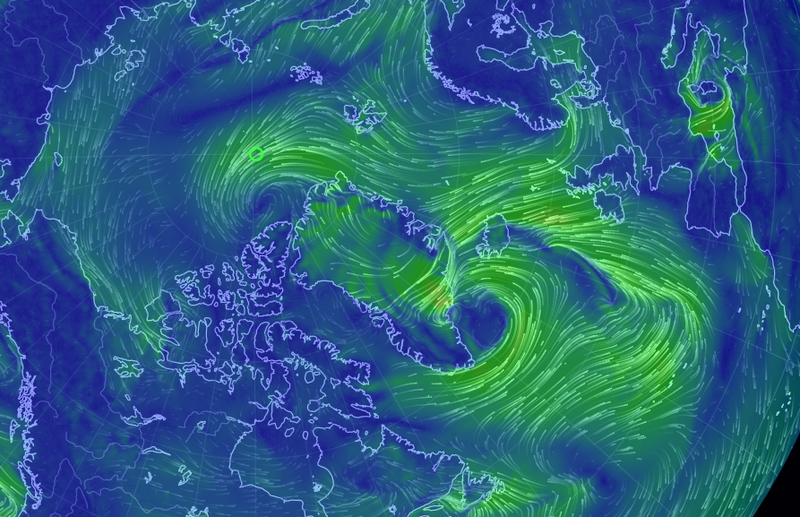 It seems the weird polar weather is due to a weaker than usual polar vortex. It normally keeps the cold air locked in, but this year is rather easily disrupted which allows cold air to shift south and warm air to move north. The vortex gets its energy from the temperature difference between the poles and mi-latitudes, and that difference has been getting less. You could see it as a self-perpetuating system. The gulf stream is probably not the main player here. If the gulf stream starts discharging into the arctic then this would be a driver of a lower differential, and hey that’s just what we have. Its not usual for ocean currents to be significantly affected by atmospheric effects, but the reverse is common. Chicken and egg? Self perpetuating systems are, of course, the drivers for modal systems such as we are discussing. Each state is self perpetuating, by definition. I noted in lurking’s plots that the cold stream that comes down the east coast of Greenland isn’t there. That is the one that makes Iceland so variable in climate,: during cold spells it reaches the north coast of iceland and brings ice, during warm spells it doesn’t. So even a minor change can have large effects on iceland, changing the water temperature by several degrees. The gulf stream is a funny system. Most of the action is beneath the surface. In the polar regions, the water cools to the air, it gets colder than the deep water and therefore sinks (salinity also plays a role). The sinking water finds its way back to the tropics. (Close to Iceland is the biggest water fall in the world. You can’t see it – it is under the sea, but it is this massive amount of water spilling over the ridge near iceland and falling kilometers deep.) This process probably drives the rapid changes in climate. The Younger Dryas started within a decade, and ended within a few decades. It started when the sinking stopped, because so much fresh water had entered the arctic and this is lighter and floats. So the gulf stream shut down. (More accurately, it stop flowing into the North Atlantic and stayed much further south. Europe froze almost instantly. There are reports that the Gulf Stream has slowed down in recent decades but I haven’t seen any convincing data. The models suggest that the slowing Gulf Stream will keep the UK cooler than it would otherwise be – still warming, but less so than the other parts of the world. 1) with extensive arctic ice cover insulating the sea the total heat loss (that is in total energy transfer terms) is low, and that is combined with a high albedo essentially acting as a silver foil cap (as against black seawater). Thus, one might posit, there would not be enough energy to generate a stable circulation with ice present. Further, melting ice reduces salinity and thus the available gravitational energy to act as a pump. Both mechanisms suggest it would be difficult to sustain a significant current to the high arctic.with an ice cap. 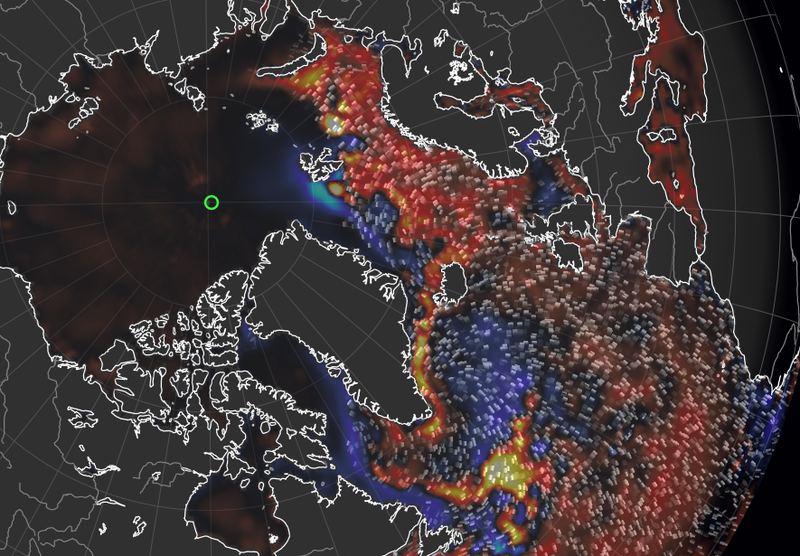 Equally the loss of ice in the arctic is likely to provide new conditions conducive to a stable new current position. 2) With no ice so less dilution, no ice so more heat loss the more saline arctic-terminating gulf stream should have more gravitational energy to generate a stable circulation. 3) The iceland->Norway ocean is relatively shallow, so easily blocked but its still 200+m deep, and very wide although admittedly the gulf stream (where?) is quoted as about 100km wide and 800m deep. How much of an impediment this ridge really is might become clear. Geolurking, the warmth in the Arctic this autumn has nothing to do with a stronger Gulf Stream. There is no evidence for this. Strong lows such as this week, push warmer moist air into the Arctic, but in fact the unusuall warm weather started in November and stayed since then. So, this is also not caused by the Icelandic lows. Still they aggravate the warmth when they position themselves southwest of Iceland. Svalbard in the Arctic has been with this strange above-freezing weather in several ocasions since November. Also an unusual warm winter in Iceland. We have seen warm anomalies all over the world in 2015 and 2016, so it is very likely that the warmth is still going around and affecting now the Arctic. If this continues, I expect to see record summer melting in 2017, even to the point of almost no ice left by September. Most people are only aware of the state of the Arctic by what they read in the internet. Sadly I have seen things with my own eyes. The Arctic has been warming fast and conditions are for a summer ice-free Arctic within a decade or two. I don´t think this has a connection with ice ages yet. Arctic ocean melting does not seem to affect the Gulf Stream. Melting from Greenland ice cap is another story. And this has been dramatically increasing in speed too. So the risk for a major climate shift (such as triggering a ice-age due to stronger melting caused by manmade warming) is there. But most models are not clear regarding this. What about Oraefajokull, seems that my second comment got a lack of interest…. its a massive volcano and it has had a significant shift in activity in recent months. I would argue that the sea surface temps around AK are the main culprit for the arctic weather as they have been very warm for 3 years in a row, sending warm air aloft over the arctic at times creating frigid temps in the states (see winter of 14-15). This pattern has been very persistent and has more of an impact IMO. I haven’t been able to find any flow estimates for the fire hose at Kilauea. I suppose it will be difficult to eventually put a VEI number on it as it’s going to be tough to measure the lava volume in the ocean, especially with addition from the material from the falling cliffs. Just wondering, but it seems like an immense amount. Has there been any effect on the air quality in Hawaii? It measures eruption volume. It doesn’t ask how the eruption took! But if you take it per year, it still manages VEI4 most years. Slight correction here, the Volcanic Explosivity Index is only about what explosively hurls out of a volcano. As such the ongoing 1983 eruption of Kilauea is a VEI-1 currently. This only puts the finger on how ridiculous the VEI-scale is when used on effusive eruptions. Hans Rosling has died. A big loss. He was the voice of optimism. A short comment (well not so much) upon the state of 4 main Icelandic volcanoes!